Dress your dog in this Ewok costume from Star Wars. Costumes for “Star Wars,” “The Wizard of Oz” and characters from many other movies are readily available in one source … but for dogs and cats only. Find you’re a costume for your favorite hair or furry friend at the Posh Puppy Boutique where we stock literally thousands of pet costumes and outfits. For example, we sell this simple Star Wars Ewok Dog Costume ($25) for small and medium pooches only. The Force lives in your dog, making him or her a perfect companion for your children in their Star Wars-themed outfits. Find this Yoda--may the bark be with you-- costume at the Posh Puppy. Maybe you prefer Yoda ($25), Princess Leia ($25) or a trip to the dark side with Darth Vader ($25). Sizes for each costume vary but in general run from small to extra large. All costumes include a jumpsuit and headpiece if appropriate. You can extend your Star Wars fandom beyond Halloween with our extensive collection of Star Wars character-themed dog collars and even this great looking, gold on black Star Wars Harness ($55), complete with “D” ring for leash attachment. The harness measures 6-7 inches long and comes in sizes from extra-small to medium. Costumes for the Tin Man ($27) and other “Wizard of Oz” characters are also very popular for Halloween. The Tin Man costume comes in sizes from extra small to extra large, fitting every breed from Chihuahuas to Labs and all those in between. We also sell costumes from the Wizard of Oz. Your little Tin Man can accompany his favorite little Dorothy ($48) in her blue gingham dress. This easy to apply dress includes a pair of matching hairbows. Available sizes range from extra small to large. We even have the Cowardly Lion costume ($27) in sizes from extra small to extra large and the Scarecrow ($28) in the same sizes. Your pet can be dressed as a superhero. A matching human version is also available. Is your pooch more of a super hero to you and your family with the fastest tongue in the West? Dress them for Halloween in our Underdog costume $20, available in sizes from extra-small to extra large. You can even get a matching “one size fits most” human costume for $85. If your dog is more into sunshine and heading South of the Border, honor them with one of our colorful Sombreros ($22 each), which come in your choice of black, turquoise or pink. These hats are available in small and medium sizes. The brims are trimmed with gold or silver metallic tape and embellished with classical floral symmetrical shapes. We also have a Mexican Poncho and Sombrero Costume ($15) in sizes from small to extra-large. The outfit includes a colorful serape and sombrero. Check out these and literally hundreds of other pet Halloween costumes at your favorite place for pets: the Posh Puppy Boutique. Also take a bark at our extensive collection of Halloween accessories, apparel, collars, leashes and harness, costumes and toys. This Lobster Paws costume comes in sizes to fit most dogs. The Posh Puppy Boutique hears this and similar complaints all the time. Our shoppers do not have that problem because we sell costumes in a wide range of sizes. Have you a got a “teacup” pooch? Many of our double extra-small outfits will fit your tiny bundle of joy? Owners of Yorkies, Toy Poodle, Pomeranians, Chihuahuas and Australian Terriers can find a wide selection of extra-small costumes and clothing made with their dogs in mind. While costumes for medium and large size dogs are also fairly common, many retail stores leave out the bigger boys and girls. We have a huge selection of products designed to fit Doberman Pinschers, German Shepherds, Golden Retrievers, Rottweilers and Labs. We also supply measurements for many of our clothing products because one company’s small is someone else’s extra small or medium. And while we sell pre-sized costumes, we strongly suggest you measure your pet first. Why? Because if one of the pre-sized versions doesn’t fit, we have many designers who will custom make the perfect outfit designed for one dog and one dog only: yours. Consider this very popular costume, which is available in sizes from extra-small to double extra-large: our Lobster Paws outfit ($25). Made of soft, durable fabrics, its hood features lobster eyes and foam antennae. Dress your favorite dog as a flower, no matter if she is tiny or large. Another very popular costume, which is available in sizes from extra small to triple extra large, is our Flower Dog Costume ($35). It comes in sizes to fit dogs weighing as little as 2 pounds to those bigger breeds topping the scales at 100 pounds. This particular costume includes a foam neckpiece of pink and yellow petals. The green body suit works perfectly on its own as pet pajamas, ensuring your little bundle of joy stays warm on cold winter days and nights. Our Lion Dog costume is also extremely popular. Also look at our Lion Dog costume ($35) that turns any pooch into the king of the jungle. Sizes range from extra small to triple extra large. This particular one-piece costume features a faux fur mane and soft fleece body. Also hugely popular is our Monkey Dog Costume ($35), which comes in sizes from extra-small to triple extra-large. It has large orange ears extending to the sides plus an attached tail. It is made as a hoodie with stretchy material that makes for a great fit. For even fancier outfits, check out one of our many designers such as Susan Lanci, Central Bark Couture, Couture by Sophie, Doggie Showgirls or any of our many other couture pet fashion designers. This Angel Paws costume looks great even without the halo. Four major holidays are coming in comparatively rapid succession: Halloween, Thanksgiving, Christmas/Hanukkah and New Year’s Eve. One way to have your dog—or cat—look drop-dead diva gorgeous for all four holidays, and the parties and family gathering surrounding them, is by getting them a new costume dress at the Posh Puppy Boutique. Check out these costumes that work all year long. They are “simply fabulous, dahling,” to quote an unnamed actress. Our Angel Paws Costume ($25) includes a halo headpiece. Even without the hat, this dress with its silver metallic accents and shimmering wings looks heavenly all year long. Sizes range from extra-small to extra-large. The wings on this White Fairy Dress are removable. This White Fairy Dog Costume ($35) includes wings. Made with white satin and trimmed in gold, it comes with removable wings. With the wings, you’ve got a great looking costume for Halloween or any religious-themed event. Without the wings you have a spectacular party dress. Available sizes range from extra-small to extra-large. Many people treat their little girl dogs like princesses. If that describes your dog, then the Posh Puppy Boutique has the perfect outfit for you: Our Princess Pup Dog Costume ($25). Available in sizes from small to extra-large, this outfit includes a dress and a slip-on soft crown. We have outfits fit for your King and his Queen. Treat your dogs like royalty and dress your boy dogs in our K-9 King Dog Costume ($25) and his favorite girl in the matching K-9 Queen Dog Costume ($25). Both include removable crowns and have a sewn crown emblem on the back of the royal red outfit. Sizes for both range from small to extra-large. This dress looks stunning all year long. A costume whose bright colors add a touch of spring sunshine all year long is our Enchanted Snow Princess outfit ($45). Made in bright reds, yellows, blues and white, it has a scalloped hem dress with bow details, pouffed shoulders, an attached red lace petticoat and adjustable drawstring bow headpiece. Available sizes range from extra-small to extra-large. This Fantasy Alice Dog Costume ($45), which looks similar to Hollywood’s version of a French maid’s outfit, includes a collared light blue dress with black bow tie and button detail, a lace apron with sleeves, an attached lace petticoat and a light blue bow. Available sizes range from extra-small to extra-large. This Lloyd costume is one of several we sell in matching dog and human sizes. Halloween may be about six weeks away but it’s not too early to start planning your costume. Here at the Posh Puppy Boutique we can help and in a way you might never have considered: matching costumes for you and your dog. Below are a sample of the many matching costumes, and the huge selection of pet Halloween costumes, sold at the Posh Puppy Boutique. 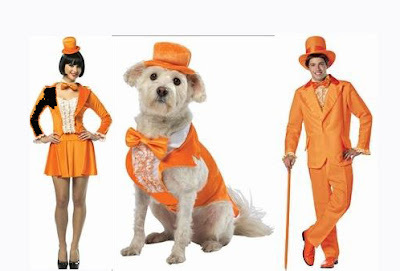 Take a look at this Lloyd Tux Dog Costume from the movie “Dumb & Dumber.” The orange dog tuxedo costume ($35) includes a jacket with attached shirt and tie plus a top hat. Pet sizes range from extra small to triple extra-large. Women can get a matching costume for $85 while the men’s version is $95. The human costumes do not include wigs or shoes. Check our online listing for details on the human costume components. If orange isn’t your color, consider the powder blue Harry Tuxedo Costume from the same movie. Sizes and styles are identical to the Lloyd costume above. Prices are $35 for the dog costume, $85 for the woman’s version and $95 for the man’s outfit. Dogs and their humans can go out looking like bacon. If your dog is the baconator, with apologies to Spike Taylor, dress them up as their favorite snack ($20) and get human bacon and egg matching tunics for $55 more. Dog sizes range from extra-small to triple extra-large. You and your pet can show you care about finding a cure for a deadly disease—breast cancer—by trick-or-treating in matching Pink Ribbon costumes. The dog costume is $20 and comes in sizes from extra-small to triple extra-large. A matching “one size fits most” people costume is $36. Get not only a jump on Halloween, but Christmas as well with our matching Elf and Human costumes. The dog costume is $20 and comes in sizes from extra-small to triple extra-large. The matching “one size fits most” people costume is $85. If your children like to color, you and your dog can go trick-or-treating with them in one of three Crayola Costumes. Color choices are blue, green and pink. The costumes include a dog shirt and hat while the human versions include a hat and a knee-length tunic. The pet costumes are $20 each and come in sizes from extra-small to triple extra-large. Matching “one size fits most” costumes are $42 for either men or women. Yes, Santa, we sell matching dog and human elf costumes, too. The Swiss Lace Pink Dress makes a great costume and formal outfit. Get your four-legged fairy princess, angel, hot dog or football fan ready for Halloween while there is still time to snag these adorable outfits. This Swiss Lace Pink Satin Dress ($70) is among the newest arrivals at the Posh Puppy Boutique. Made with pink satin and featuring a pink sparkle organza skirt, the bodice is trimmed in imported Swiss lace embellished with rhinestones, pearls and sequins. Available sizes are extra-small, small and medium only. The best news is this dress is perfect for any dressy occasion including Halloween, Christmas, New Year’s Eve, weddings and other special events. Humans who either are or know a ballet dancer will want to look at our Sugar Plum Fairy Costume ($25). Made with purple satin fabric, it has a shimmering petal skirt and floral details around the waist and on the matching headpiece. Our Angel Paws Costume ($25) includes a halo headpiece, silver metallic accents and shimmering wings. Velcro® closures secure the costume at the neck and belly. Sizes range from extra-small to extra-large. Two of our most popular pet Halloween costumes—they sell out every year, which is why we’re mentioning them in mid-September—are our Ketchup Hot Diggity Dog and Mustard Hot Diggity Dog costumes ($25 each). Two plush poppy seed buns surround your pet with a zigzag of either ketchup or mustard along the back. Adjustable Velcro straps hold the costume securely and comfortably in place. Sizes range from small to large. Our Hot Diggity Dog costumes sell out every year. Football fans, especially those living in colder areas, may want to get a jump on winter. Outfit your four-legged pal with one of our NFL Puffer Vests ($50 each). Available with the logos of most NFL teams, such as the San Francisco 49ers, they have water-repellent quilted shells, a soft fleece interior, safety stripe for improved visibility at night (and during tailgate parties), a zippered, removable fleece hood and Velcro closures. Sizes range from small to triple extra large for the dogs doing their best linebacker impressions. If style is more your choice than football, consider a designer Louis Dog Hoodie ($116) in black or khaki. Made with the attention to detail on a top designer can offer, these hoodies are super lightweight, super soft and keep your dog toasty warm using Thinsulate padding. They have a drawstring windbreaker on the end. A black fur pom pom and sparkling stones on the hood give it added style and class. Available sizes range from extra-small to small/medium. These NFL Puffer Vests are available for most teams. I'm So Corny is one example of our many glow-in-the-dark dog shirta. The days are getting shorter, cutting into your safe dog walking time. The earlier nightfall shouldn’t keep you from having a great trek with your favorite pet, not when they are outfitted with some clothing and accessories from the Posh Puppy Boutique. Our I’m So Corny So Tee ($20) is one of several shirts we sell that glows in the dark. Available in sizes from double extra-small to extra-large, this shirt helps make your leashed dog more visible to passing motorists, bicyclists, runners and walkers, no matter where you live. The shirt is made with a comfortable poly and cotton blend and has ribbing at the neck, waist and sleeves. Get a jump on Halloween while making for a safe evening stroll with our glow in the dark Vampire Dog Tee ($20). It is identical to the shirt above except for the design. This Spooky tank looks great during the day and glows in the dark. Our glow in the dark Spooky Dog Tank ($20) barks “Halloween” during the day and adds reflective elements for greater visibility at night. It is available in sizes from double extra-small to extra-large. Girl dogs may like our glow in the Witch in Training dog tee ($20) that features an orange witch’s hat on a purple background. Your dog will stand out from the crowd all Fall long. It is available in sizes from double extra-small to extra-large. Walkers, check out our K9 Night Patrol Cap ($50) designed for humans. This baseball cap has LED lights in the brim, providing hands-free lighting for you and your pet. These LED harnesses make your dog visible up to a half-mile away. Take an extra step for safety with our LED Harness and Lead ($40 for the harness, $36-$50 for matching leads, depending on length). These harness come in red, white or blue. Best of all, they glow from every angle, letting your dog be seen up to a half-mile away. The harnesses are a sturdy, step-in design, making them easy to attach and fit over your dog’s clothing, even during bad weather. Sizes are small/medium and large/extra large. These are just a small fraction of the fashionable and functional pet clothing and accessories available for your favorite dog or cat at the Number 1 online pet accessory store: the Posh Puppy Boutique. Fall will be here soon. Keep your pal warm with a new sweater from the Posh Puppy Boutique. Summer may seem like it is still in full-on heat mode with scorching temperatures and hot sunny days. Officially those days end on Sunday, Sept. 22 when the calendar says Fall falls. Get your little four-legged friends ready for fall—and its ferocious cousin, winter—with some new outfits from the Posh Puppy Boutique. Sweaters, coats, hoodies and other comfortable, fashionable clothes are waiting for you right now at our online and Rocklin, Calif. retail store. Check out these brand-new fleece pullover sweaters that are sure to make a fashion statement while keeping your pup—or pug—comfortable. Our Aztec Print in black or Desert and our Striped Reversible Pullover in red and charcoal are only $30 each. Sizes range from extra-small to large. Each sweater is proudly Made in the USA. Get a jump on Halloween with this 100 percent acrylic, machine washable sweater Pumpkin Pup Sweater featuring a smiling pumpkin face. Four sizes are available. The Pumpkin Patch Sweater ($35) from Truly Oscar (Oscar Newman) has a pocket, hand-sewn pumpkin and maple leaf and a ribbed collar. Sizes range from double extra-small, for the tiniest and youngest little ones, to large. These blanket plaid fleece pullovers are stylish and warm. Go fashion foot forward with one of our new blanket plaid printed fleece pullovers. Available in red and camel ($30 each), they are Made in the USA of anti-pill fleece. Sizes range from double extra-small to large. Consider the classic look of our Heather Gray Chunky Cable Knit Turtleneck ($45) with buttons and two pockets. These sweaters show your style and forward-thinking fashion sense while keeping your dog warm. Seven sizes to fit dogs weighing from less than 5 pounds to 80 pounds are available. The classic cable-knit sweater is now available for dogs. Take hoodies from the playground to the runway with one of our many choices. This purple Embroidered All Girl Hoodie ($45) comes in sizes from medium to double extra-large. Made with 100 percent pre-shrunk cotton fleece, these hoodies are lined with white cotton fleece. They also have two leash ports for safe, secure walks any time of the day or night. Also look at the pink embroidered Girls Rule hoodie ($45), which is similar. Here’s a shopping tip from the Posh Puppy: keep a nice, soft tape measure handy. Our clothes designers make their products with specific measurements in mind. One designer’s small can be another designer’s medium, which is why we always include back, chest and neck measurements when available. Checking your dog’s figure is the best way to ensure a great fit. That little green and white symbol in the upper right corner tells consumers this product meets very strict standards for purity. The label on your dog’s clothing or your pet’s treats says it is made “made with organic ingredients,” but is it? 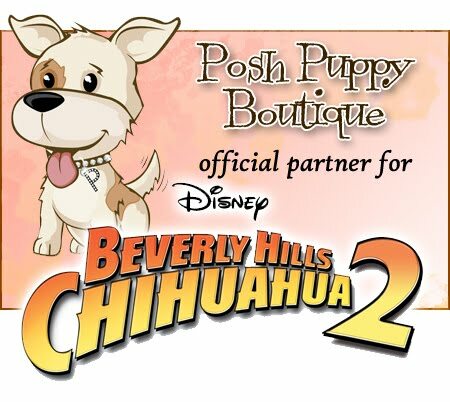 Here at the Posh Puppy Boutique we carry a mixture of items. Some are organic; many are not. One way to tell if a product meets the most stringent organic standards is by the presence of this symbol, one that says USDA Certified Organic. Click here for a description of the strict standards enforce by the U.S. Department of Agriculture. One example is our Whole Life Certified Organic Chicken Treats ($15). Made from human grade organic chicken breast meat sourced in the USA, these tasty snacks are also grain free. These toys are also USDA Certified Organic. Some toys, not just treats, also meet this standard. The Loofah Fish Toy ($15) is made with 100 percent vegetable ingredients and given a meat flavor your dogs will enjoy. The toy will help clean your pet’s teeth. Click here to see all of Loofah’s USDA Certified Organic toys. Organic crops earning this seal are verified to be grown without using radiation, sewage sludge, synthetic fertilizers, prohibited pesticides or genetically modified organisms. These Louis Dog clothes are made with organic materials. Louis Dog’s Organic Denim Dress In Cloud Blue ($77) meets other organic standards including the Global Organic Textile Standard (GOTS) and the Organic Exchange standard, which was recently replaced by the Organic Content Standard. GOTS labeled “organic” products must use at least 95 percent certified organic fibers. Products using the lower grade “made with organic” label must contain at least 70 percent certified organic fibers. 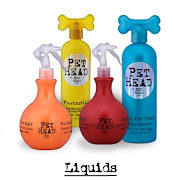 Many Louis Dog products meet the GOTS requirements. They include clothing, carriers and cushions. Click here to see them all. Here at the Posh Puppy, more than 300 of our products are either certified organic or made using organic ingredients. Just type in the word “organic” in our search box for a list of items identified as organic or containing some organic materials. Another example, which is perfect for your dog’s next Halloween party, is our Spider Cake Bites ($20). This boxed set of four treats is made with organic oat flour, organic brown rice flours, organic molasses and other ingredients. Organic ingredients are used in these treats.